Twilight, and understanding twilight for aviation is important for one reason; Night flying. Can you log the hours you flew as night time flight? Are you current in night flight? As we enter the fall / winter months our daylight hours get shorter so pilots start caring about these nuances more. The definition of twilight, and which twilight is important for what purpose, can be confusing to understand. Let’s break it down to help that understanding. Hmm, that’s not entirely helpful. What is ‘full night’ in this definition? Let’s go one step deeper. Twilight is from the moment the sun is fully below the horizon (sunset) until there is no more sunlight and the sky is completely dark. Or the reverse in the morning, when the sky starts to brighten, but the sun is still below the horizon. All things being equal, the sky is completely dark when the sun is 18* below the horizon. As if this isn’t confusing enough there are three sub-categories of twilight. 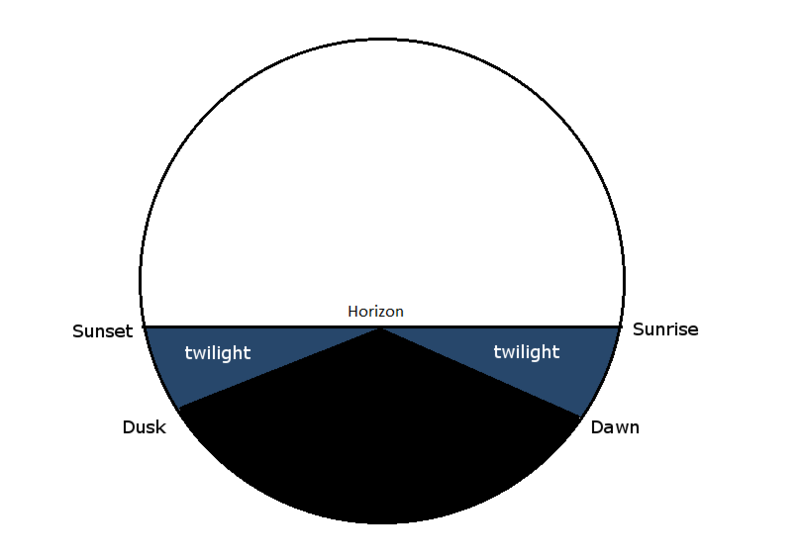 Civil twilight, nautical twilight, and astronomical twilight. For the purposes of flight, we really only care about Civil twilight. Now, let me tell you the last time that I pulled out a protractor and measured when the sun was 6* below where I could possibly see it. In fact, even the air almanac states that this is an ‘arbitrary condition’. So, after further research into the almanac I found that it specifically lists the start/end time of civil twilight for every third day of the year. For example, this post was written on September 26, 2016 and according to the air almanac morning civil twilight starts at 0525 for my latitude and evening civil twilight ends at 1817. It also has sunrise at 0550 and sunset at 1752. This is great for planning purposes but I really don’t feel like pulling up a gigantic scientific document every time I want to fly to understand when night time flights count. So, based on simple math one can determine that on average Civil twilight lasts for about a half hour after sunset and before sunrise. Now we are getting somewhere. Sunset and sunrise is usually shown on the morning news and every weather channel you can find. So I can guess the approximate time of civil twilight based on the daily report of the sun. So, you can log a night flight between the period of 1/2 hour after sunset to 1/2 before sunrise. However, federal organizations can’t really make something quite that easy so there are other definitions of ‘night’ that a pilot needs to understand. There is some specific wording in regards to Alaska that you can check out if you need to. There are night currency requirements as well when talking about taking passengers on your flight. You can find them located in FAR 61.57(b). This regulation states that from the period of 1 hour after sunset to 1 hour before sunset, you may not carry passengers unless in the preceding 90 days you have made 3 take off and 3 landings (to a full stop) during the period of 1 hour after sunset to 1 hour before sunset. This currency requirement is also restricted to a plane of the same type, category and class as the plane you are carrying passengers in. So, let’s recap all this in a short and sweet, easy to understand way. Your lights must be on from sunset to sunrise. Civil twilight is the period 1/2 after sunset and 1/2 hour before sunrise. Night flights can be logged from evening civil twilight to morning civil twilight. Currency requirements for passengers is 3 takeoffs and 3 landings to a full stop from 1 hour after sunset to 1 hour before sunrise. Wow, that’s a lot of information but if you are going to be flying either close to or during night time it’s important to know the regulations. No one wants to land and get a phone number they have to call. 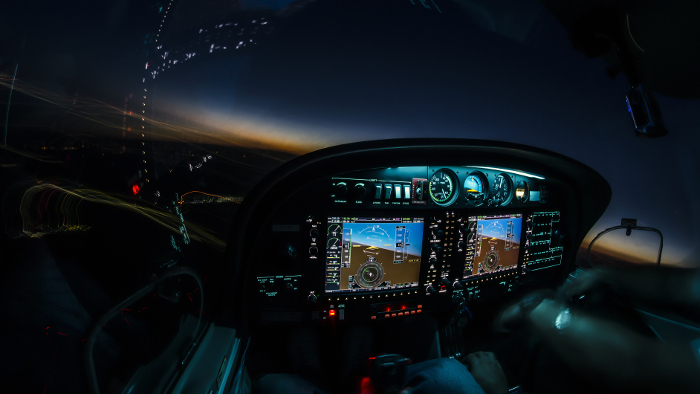 How often have you flown at night? Do you prefer night flights in the fall / winter or the spring / summer? Let me know in the comments. Winds are something pilots learn to have a love-hate relationship with. A tailwind gets us there much faster and a headwind can make for a very long trip. However, one type of wind can ground pilots before they make their flight is crosswinds. Crosswinds is the amount of wind that hits your plane from the side. If the strength of the wind is enough you can have a really bad day. Your plane may be blown from the runway causing damage to the plane, or worse, you and your passengers. While headwinds are frustrating while in flight, during takeoff and landing a headwind is preferred. A solid headwind during takeoff will have the plane in the air much faster. And while landing a headwind helps bleed off speed while keeping the plane off the runway for a little while longer. Understanding the crosswind and headwind components is critical to having a safe flight. There are several methods to determine both while you are on the ground, and a few ‘quick tricks’ for when you are in the air. A note of caution. Any of these calculations are representations ONLY. The actual crosswind component can and does vary depending on the day, the wind and the airport you are at. Use your calculations as a guide and remember that things often change very quickly in the plane. Remember to always fly the plane, rather than the paper. The ANGLE between the runway heading and the Wind. To find this you simply subtract the larger number from the smaller number. For example: Runway 8 has a heading of 080 and the Wind is from 110. Simply subtract 80 from 110 (110 – 80) to get 30*. The VELOCITY of the wind. This is given by the ATIS and is usually in Knots (KTS). Any GUST information is also needed to get a more accurate picture of the crosswind that affects your plane. One of the first ways I learned to calculate the crosswind was from the Jeppesen Private Pilot Manual. This chart, like a lot of charts for aviation is an analog chart. The downsides of this are inaccurate results and some element of guess work. Determine the angle between the runway heading and the wind. Find the point where the wind angle line and the wind velocity arc meet. Look to the left to find the headwind component. 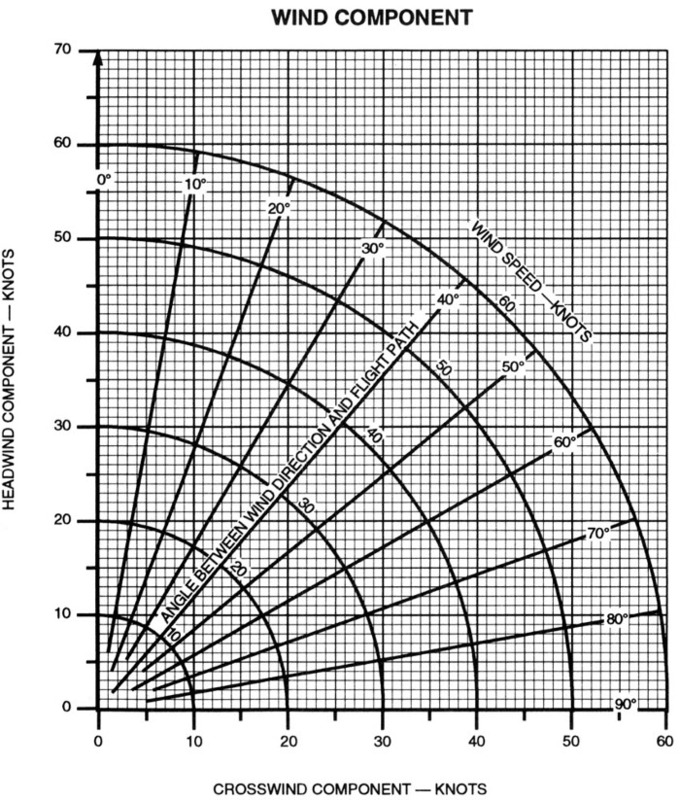 Find the crosswind component by following the vertical lines down to the bottom of the chart. Very few ground lessons don’t involve math, and this concept has a mathematical explanation behind it. If you can remember back to your algebra ( or trigonometry ) classes you may remember sine/cosine/tangent angles. While we could go into a deep math class I’d rather stick to a higher level. For this exercise you will need the sine of the angle to determine your crosswind component. Here is a nifty chart to help you remember those angles (note, these values are rounded for ease of remembering). This gives you a more accurate answer than the wind component chart above if you needed it. Now, for testing purposes, I would wait to round your results until the final answer as that may make a difference in the results. If math is more than you want to do, here is a handy chart created to give you accurate data. 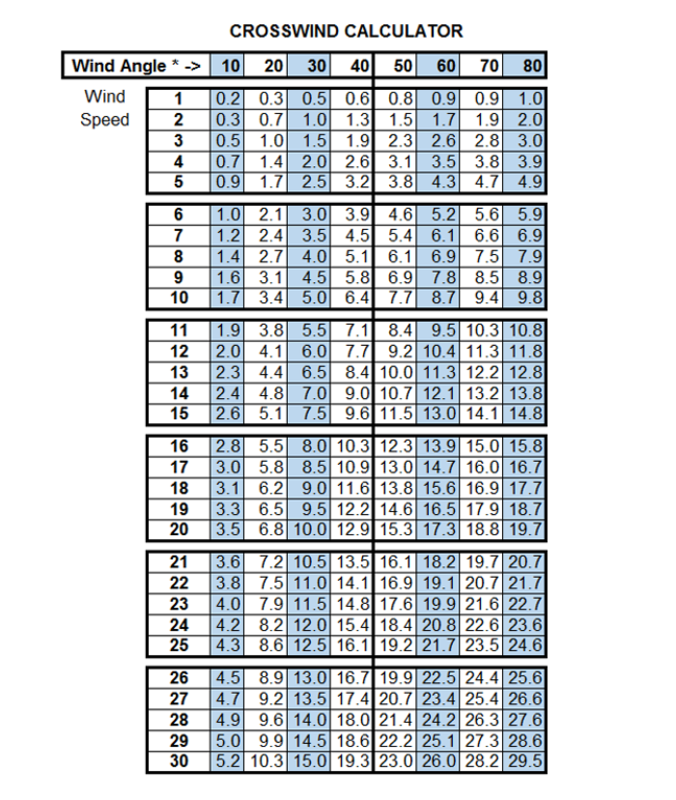 For this chart, simply match the Angle column with the wind speed row to find your Crosswind component. For the Headwind calculation you only have to subtract the wind angle from 90* and follow the column down to the wind speed. So, 90* – 30* = 60*. 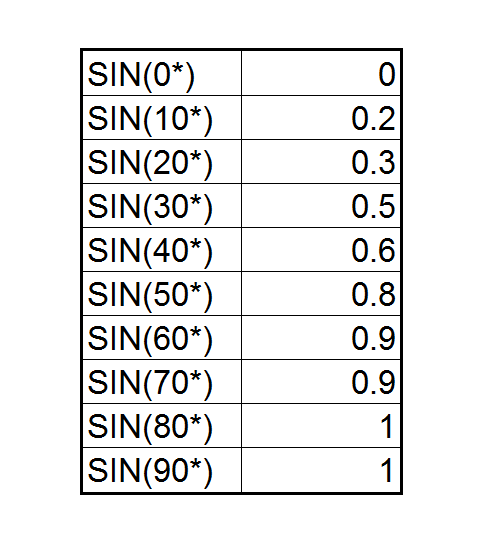 Meaning we are going to use the 60* column for our angle. There are a few online calculators that will do all the work for you however they won’t help you when you are in the cockpit and need to do calculations on the fly. However, for the completeness of this post here are some of the online calculators. Now I’m not sure about you, but I don’t keep a crosswind calculator or a crosswind chart handy in the cockpit. And I guess I could remember the SIN/COS tables and do a boat load of math in my head while I’m trying to fly the plane. 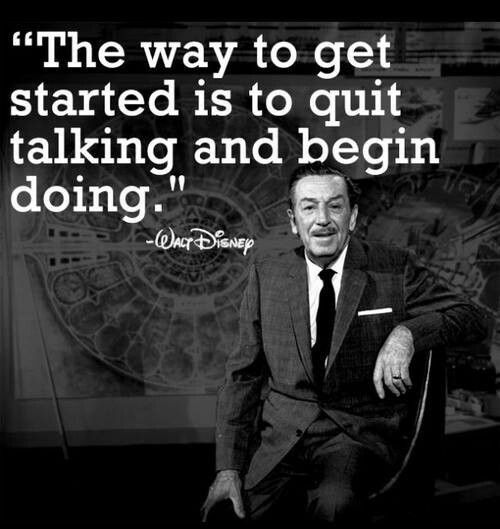 However, that doesn’t sound appealing with everything else I have to remember to do. So, here are a few simple methods to get you in the close ball park of what the crosswind component would be. This is an interesting method that I learned about while researching crosswinds. I have yet to use it in real life, but for very rough math it works to help remember what the crosswind should be. Your watch is a representation of the Angle of the wind. The 60 minute, or 12 o’clock position, represents 60* and 1 or ‘the whole’ wind speed. Effectively all crosswind. At 45 minutes it’s 45* and 3/4 of the wind speed. 30 minutes is 30* and 1/2 of wind speed. 15 minutes is 15* and 1/4 of wind speed. For this calculation I used the 45*, 3/4 wind speed since that is the closest data point to the 50 * angle. This method has an inherent flaw that is found in the second scenario. 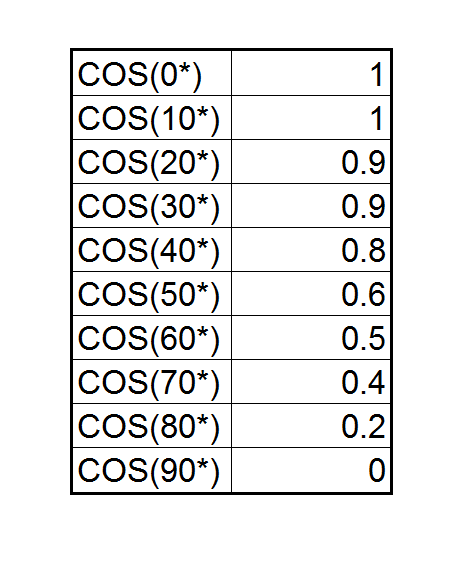 Unless you want to do additional math, the 50* variance is not accounted for. So one can reasonably state that the crosswind is “probably a little more than 15 KTS” and when you are in need of new information in the cockpit this will get you darn close to what you need. These fractions are then multiplied to the wind speed. Our example then becomes 30* angle = 3/6 or 1/2 of wind speed, which is 20 KTS for a total crosswind component of 10 KTS. With all things, the wind is always changing. Any pilot who has had at least two lessons has most likely heard an ATIS report that mentions gusting winds. And if they haven’t heard it on the ATIS they will get it on a test question for the METAR understanding. This bodes the question, how do you calculate for gusts? Well, the same way you calculate for the normal winds. You need the angle and wind speed and then you perform the calculations exactly the same for each method. Your crosswind and headwind component will be somewhere between the two results you get back. Every plane, even the big birds have limitations. Crosswinds are no exception to these limitations. In the Cessna 172 that I fly there is a POH direct crosswind limit of 15 KTS. This is more than I would currently fly in but it’s nice to know what the test pilot’s said the plane could do. Now, there are some who say that the POH is only a recommendation, not a limit, but I’m not in the business of becoming a test pilot any time soon and my life and my passenger’s lives all depend on my ability to safely control the plane. In my opinion, it is best to stick with the limits listed in POH and determine your personal limits from there. Personal limitations are those limits you set on yourself. What you are comfortable flying in or when you have reached the extent of your knowledge and skill. These are the limitations that get some pilots into trouble when it comes to flying in crosswinds. The problem with personal limitations, is that you usually find your limit by trying a skill / maneuver / flight and discovering that you are not ready for that event. It’s the flying equivalent of a catch 22. You should set personal limits but you don’t know what your personal limits are until you have reached them. For me, because of the weather patterns here in the desert I have a personal minimum where I don’t fly in the afternoon. The wind can be too erratic and the gusting makes for some really unstable air. Even if the wind is straight down the runway I would be too wary to fly as things can, and do, happen in an instant. What is your preferred method for calculating crosswinds / headwinds? Is there a crosswind calculator that I missed? 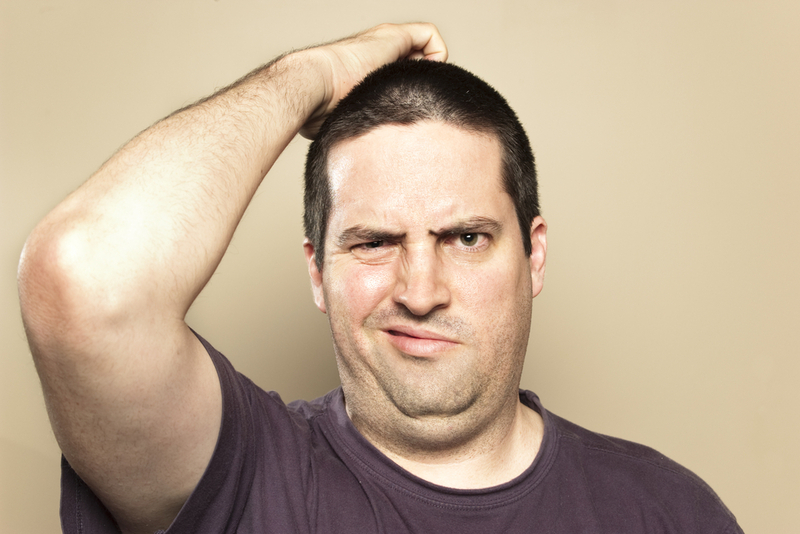 How often have you actually taken the time to calculate the crosswind component other than for a test? Let me know in the comment section. Every general aviation pilot, at least once in their flying career, will need a biennial flight review. What is the biennial flight review? Sometimes referred to as a BFR, the flight review is a two year check up on your piloting knowledge and skills. It is designed to make sure that as a GA pilot you still meet the necessary skill level to fly safely. Technically, it’s called a flight review. The FAA dropped the ‘biennial’ from the phrase due to confusion. Some folks were calling it the biannual, which means twice a year rather than every two years. So, to fix the confusion the word was dropped and now it’s just the flight review. It isn’t a method for the FAA to take away your license and it isn’t meant for you to spend more money on flight training if you are flying safely. So it’s nothing you should avoid or be nervous to schedule. In my flying career I just came up on my first ever flight review so I’ve officially been a licensed pilot for two years now! Yay me. Not knowing what a flight review consisted of, but knowing I was due for one I did some research before hand to help me get that sign off. 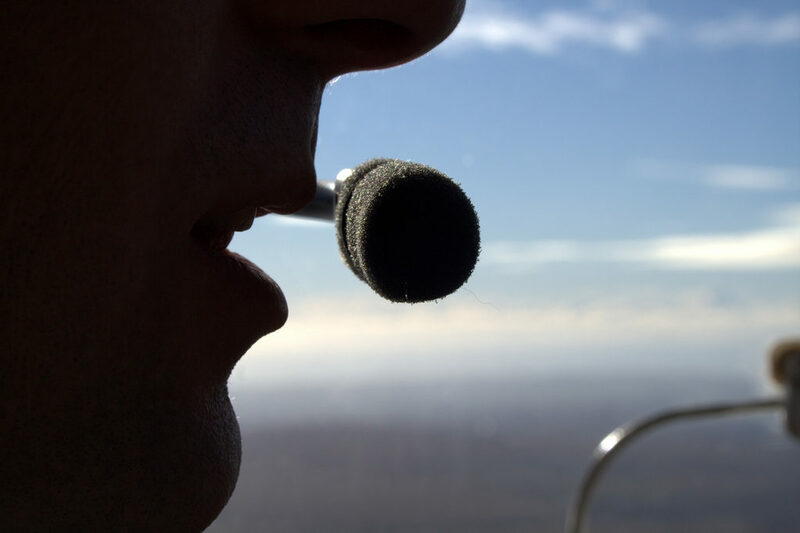 Flight reviews must be conducted by Certified Flight Instructors, or CFIs. ANY CFI can sign you off on your piloting skills but it doesn’t hurt to find one who can teach you a thing or two. What does a Flight Review consist of? consists of a minimum of 1 hour of flight training and 1 hour of ground training. the safe exercise of the privileges of the pilot certificate"
While the minimum requirement is 1 hour of ground and 1 hour of flight don’t be alarmed if your CFI determines that you need more. It is in your best interest to get all the quality instruction you can during a BFR. 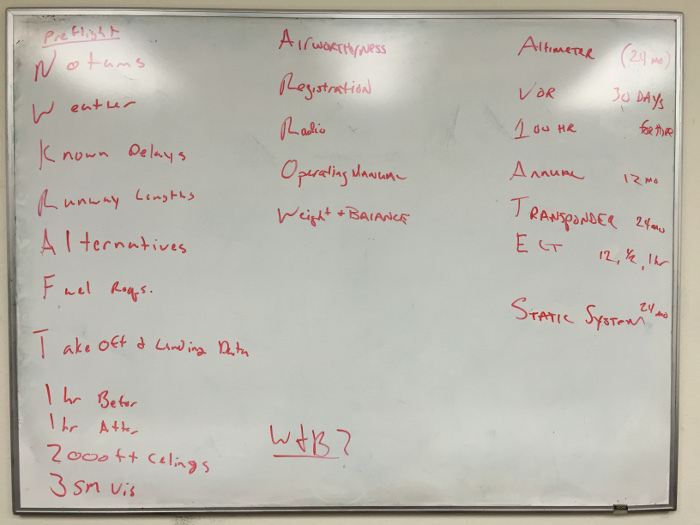 If you’re anything like both me and my instructor the whiteboard is a very useful tool in the ground instruction. Not only for learning new things, but to quickly test knowledge. One of the best ways to pass your BFR is to actually show up for it. It’s due at the end of every 24th calendar month from your last major check ride. Now, there are ways to delay your flight review, such as the WINGS program and other endorsements / check rides but those nuances are not covered in this post. Schedule your BFR with plenty of time left in your month so you have some wiggle room if needed. I had mine scheduled for the 18th. I planned my day and did a brief check of the weather before I showed up at my FBO. The job of the CFI is to determine how knowledgeable you are in the current regulations. Imagine this as a ground school lesson. 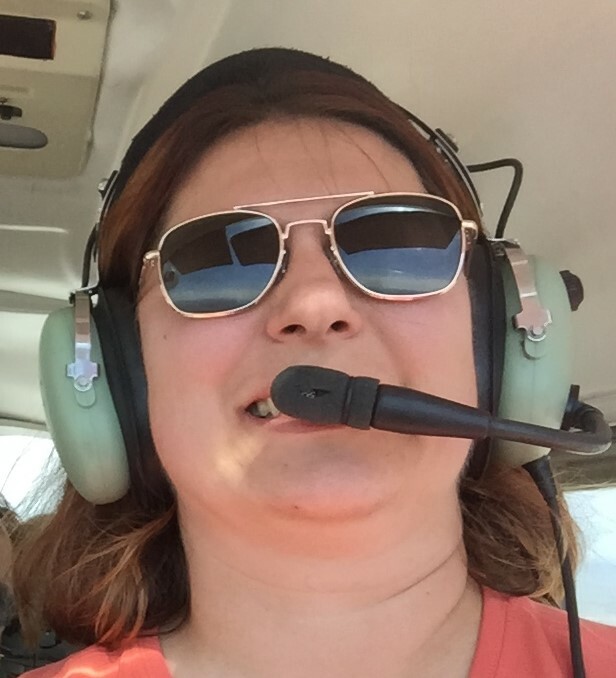 A good CFI will ask questions but is willing to teach you those things you may not have a strong grasp in. For example: My knowledge of all the aviation acronyms is horrible and my memorization of the airspace dimensions is non-existent. Rather than trying to fake my way through the ground portion I was honest with my instructor. I told him where I would go to find the answers to those questions and that wasn’t always the FAR/AIM. Google is a very viable source to start your search for such things as what the acronym AV1ATES means. There is nothing that will ruin your flight faster than the CFI thinking you are not a safe pilot. You can make mistakes. You can not be perfect. However, unsafe flying will cause your instructor to require more time with them before they will provide their sign off. I tend to speak everything I’m thinking so that helps my instructors to know what I’m going to do before I do it, but I have always had safety on my brain. From using the checklists religiously to keeping an eye out for a suitable place to put the plane if needed safe flying is key to your review. This is YOUR review. Your CFI is evaluating you, but it is a great time to ask them those burning questions that you have built up over the last two years. A question from you isn’t going to end your review unfavorably. In fact, it shows your instructor that you are engaged and focused on what you are about to do. For example: I asked my instructor how critical it is to know the dimensions of airspace. I know the cloud clearances and entry requirements but I’m not top notch on (read I couldn’t begin to tell you at all) the standard dimensions of each airspace. In my mind, the sectional is the be-all, end-all for dimensions so if I need to know what the shelf height is then I’ll check the sectional. By asking this question I kept my instructor engaged in the ground as well as learned how he approaches this issue. It’s a giant learning experience and if you don’t ask questions then you are at the mercy of your instructor. Anytime I fly with a flight instructor I have something to learn. Something I can work on to improve my flying, or make a maneuver that much better. This time I found that there are more types of stalls than the two I’ve practiced in training. Each stall has a different name bu the effect is the same, stall horn, buffering then drop. The question is how fast you recover (or do you induce a secondary stall, a type I wasn’t aware of before my review) or what maneuver are you doing to increase your “stall speed”. I also learned this time around that I have some very serious work to do on the steep turns. They still don’t feel right to me and when I do hold the 45 all the way around I am behind not only the power curve but the back pressure curve too. I guess that’s another good reason to keep flying. All in all, my instructor thought I was a safe pilot who did what it takes to make sure my flight is successful. Sure, there are things I can tweak but he gave me the sign off because he was confident in my ability to fly the plane. That’s all a pilot wants to hear! There are two methods out there, from what I have seen, to delay the requirement for a flight review. I’m going to work on taking advantage of these in the next 2 years to see how well they work as well as to increase my continuing education. 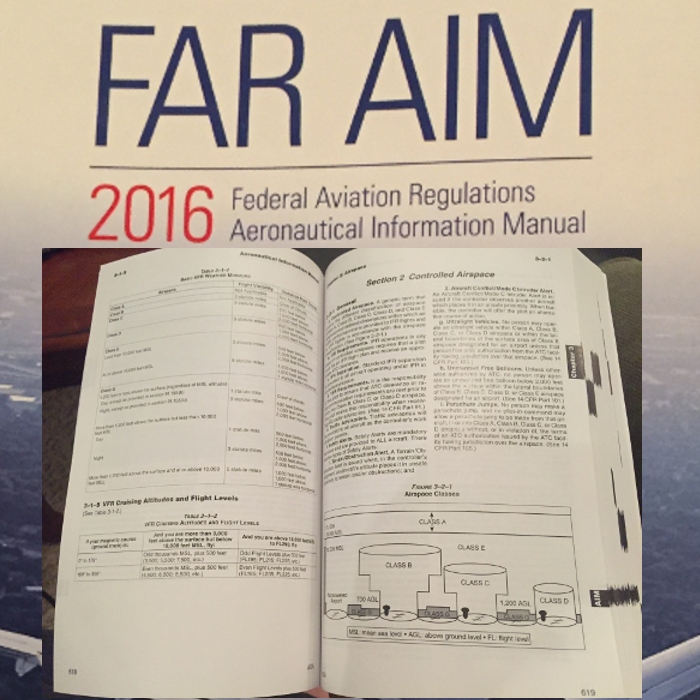 The FAA safety team has built a great program to give you credit for continual learning. By taking online courses, attending seminars and even flying with your CFI you can earn credit that will push off your flight review. There is even a convenient display to show when your next flight review is due based on your credits. I will be going more in depth on the WINGS program in another post so stay tuned for that. If you add an additional rating to your piloting resume you reset the clock on the GA flight review. For example, you pass the check ride for your instrument rating the month before your flight review then you reset the clock from the calendar month you passed your check ride. If you are adding an endorsement to your flying resume, ie high performance, it can reset your flight review counter only if your curriculum includes a flight review. This means that if your CFI does a flight review while you are earning your additional endorsement it can reset the clock, but that isn’t technically a way to reset it if you do a flight review anyways. So, here’s to the next 2 years of flying, learning and finding out how small the country really is when you can hop in your plane. Have you gone through a flight review? How many have you had? Do you remember your first flight review? Let me know about your experience in the comments section. Let’s be honest, everyone needs a watch, but it seems that Pilots really love their watches. And for good reason. So many things in a Pilot’s life is based on time. How long to fly from one leg to the next; How long to rent the plane; When do you need to show up for duty, etc. However, most pilots don’t start off making a lot of money. 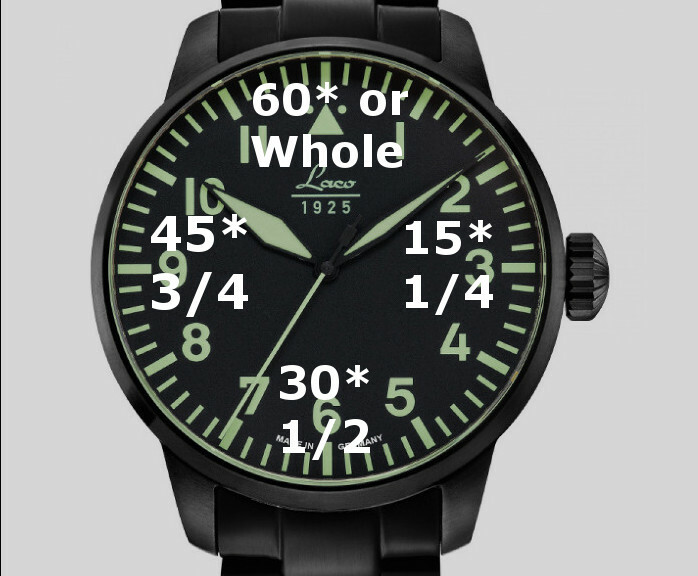 So I’m not sure how useful a $10K watch is for a low hours, beginning pilot. Some of these watches can be found on Amazon.com and others from local boutiques. Prices are always subject to change and I am not an affiliate of any of these fine timepieces. On Saturday morning I woke up and got ready for my day at the airport. 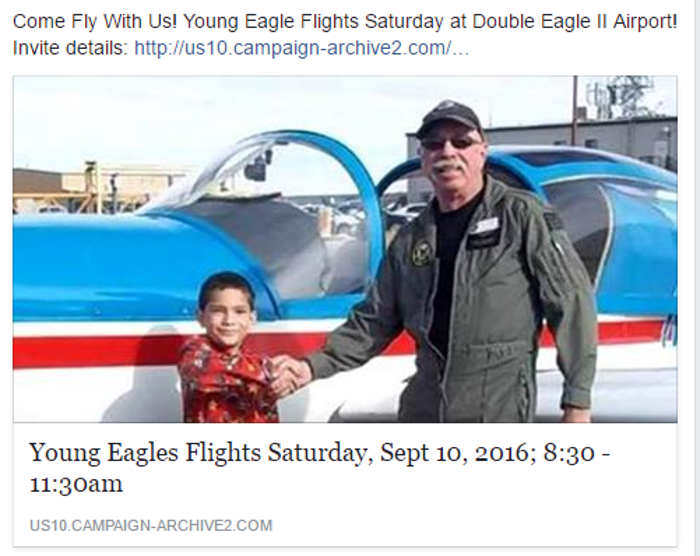 The local EAA chapter was doing a Young Eagles Flight event and I volunteered to help. I am ecstatic to help as a pilot on the ground with briefings, education and keeping kids engaged while they waiting for their young eagles flight. The more I have put into aviation the more I get out of it. So I was off to another volunteer event. A few phone calls and date picked was all I needed to start planning my flight for my first $100 Hamburger. This 100 Dollar Hamburger actually turned out to be a little more pricey, since I was renting, and not a hamburger at all. It was a $100+ french toast since we were making a breakfast flight. I was listening to one of my may podcasts on my way into work one day and they suggested using Air Sports Net’s weather, USAirNet, as a tool for weather forecasts. Since I’m always interested in learning new ways to improve my flying I figured I would check it out. I’m glad I did. The weather section of the page is a great addition to my pre-flight planning. Specifically I really like the three day forecast they do. They get the raw data direct from the National Weather Service’s GFS MOS Guidance and display it in an easy to understand format that shows all the things I want to know about in 3 hour blocks over a 64 hour period. When speaking on any radio many of the letters of the alphabet, or numbers for that matter, can sound the same. Try saying B,C,D and Z and you may be asked to repeat yourself several times. Heck, even when talking on cellphones sometimes letters can sound the same. I can’t tell you how many times I’ve had to breakdown and use the phonetic, or aviation, alphabet. This can cause a problem when you need know what taxi way to be on, or when telling ATC your tail number so they can keep tabs on you in their system. The miscommunication possibilities is one of the many reasons pilots need to read back clearances to ATC. It makes sure that everyone is on the same page. Stuck in a Fog of confusion when looking at the METAR? This handy guide helps you to decipher the code using an ADDS METAR report. Pilots are responsible with understanding “all available data” before they embark on a flight. Many pilots, this one included, will start with the MEteorlogical Terminal Aviation Routine, or METAR for short, for their departure and destination airports to get a solid understanding of current conditions. It records the hourly surface weather observation and can be either Automated or Visually observed. Also called Meteorlogical Aerodrome Reports they do not show any kind of future weather but they can be very useful for displaying the trend of the weather. I am still starting my career as a pilot. With low hours in the pilot seat and a high passion for flight, I want to learn as much as I can to be the best, safest pilot I can be. My goal is to become an instructor and help others find the passion that I did.